I am a redhead to my core. It’s in my heart. It is absolutely my dream to look just like this. The woman in this image is a dear Curl-friend to me. True story: my husband and I were driving to the salon and we passed this massive halo of red curls. My husband, trying to impress me says, ” Red hair and curly hair is trending now, right?” I thought that was so cute; my sweet political husband tried to coexist in my world. I do the same to him by casually name dropping U.S presidents in public conversation. Anywho, my immediate response was, ” I would love to play in that hair,” and we proceeded on to the salon. Now would you believe when I was introduced to my first client of the day, she just happened to be the Redhead Curly Supreme you see above! A match made in Heaven. This image was our second hair affair. We gave her a curly cut at an A line with cascading layers. This cut is inspired by the Devacut. 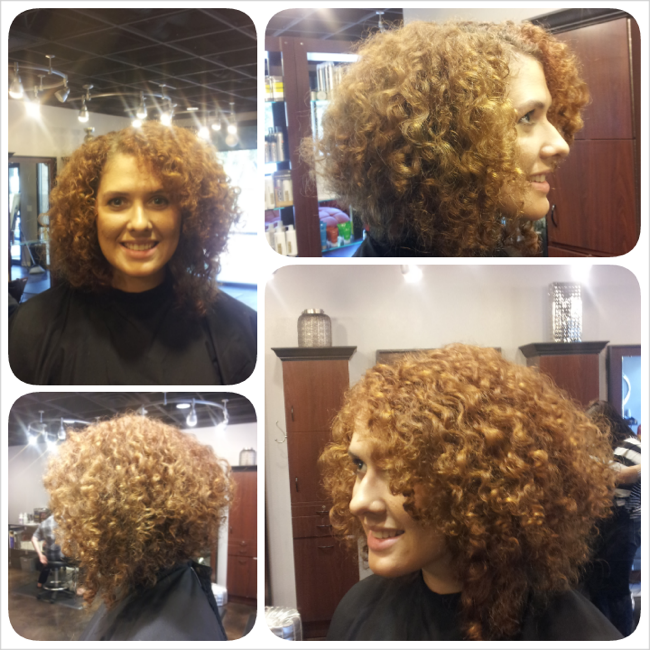 Curl by curl, we shaped her hair and styled with Erayba Phase 2 Leave-In Spray followed by Erayba Curl Defining Spray. Light and intentional, this product delivers the definition you need while still soft to the touch. Great for type 2 or 3 curl types. Curls were cleansed and hydrated with Erayba Nutriactive Shampoo and conditioner for a sleek palette before styling.